There’s nothing like a sweet pack of cars approved by the folks at Top Gear to brighten up a dreary winter day. The Top Gear Car Pack for Forza Horizon 2 on Xbox One is available now, and it’s got something for practically every kind of car fan. We kick things off with the latest Lexus sport coupe, the 2015 RC F, which is one-part luxury, one-part pavement shredder. Next, the BMW M235i brings lithe form and its own impressive rear wheel drive to bear. 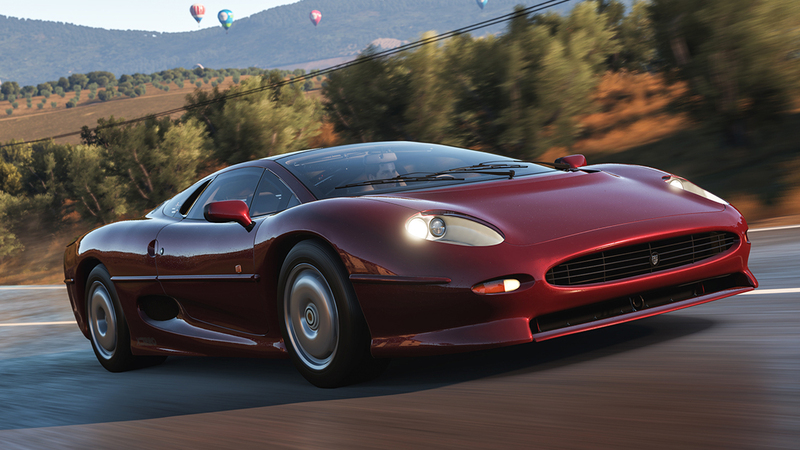 If you’re in search of a land speed record while driving in exotic style, the Jaguar XJ220 awaits. Extreme Cross Country events will never be the same with the presence of the “Rambo Lambo,” and the heraldic trumpeting of the Ferrari 458 Speciale will bring glory to practically any setting. This month’s free car, the Ford Lotus Cortina, is also waiting to be tossed around Storm Island or model for you Forzatographers. What follows is the full rundown of each the cars in Top Gear Car Pack. 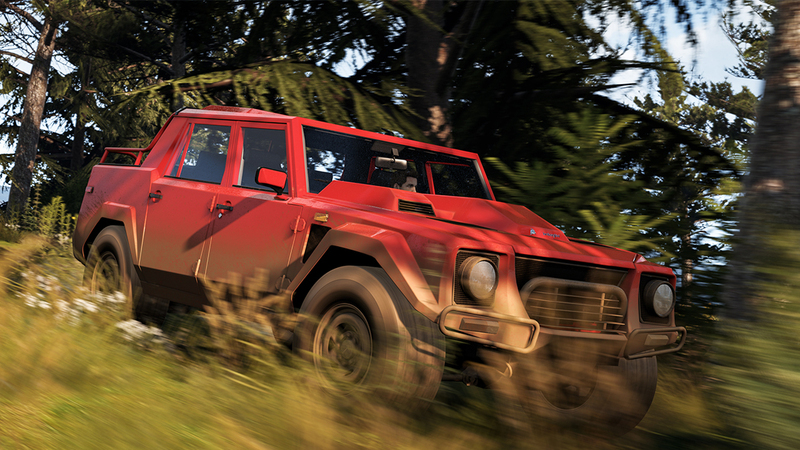 Is it the best Forza Horizon 2 DLC pack… IN THE WORLD (as Top Gear’s own Jezza might say)? That’s up for you to decide. 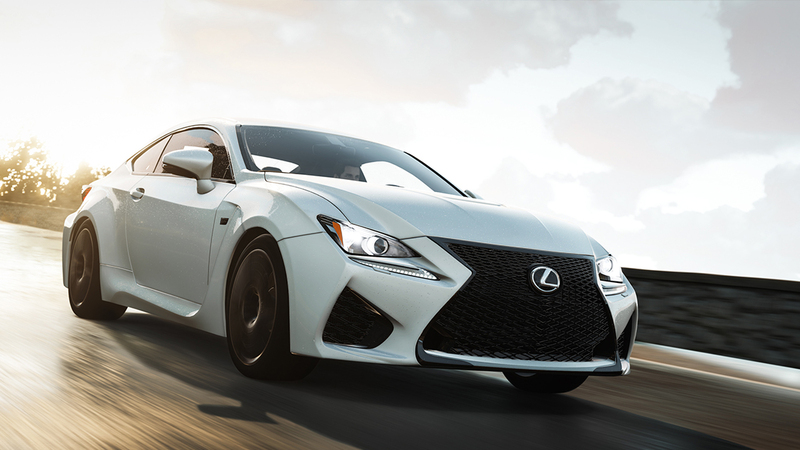 The RC F is much more than a GS Sedan minus a couple doors. While not entirely bespoke, it is bred from top stock. For an optimized track width the front clip is from the GS Sedan. For stiffness the middle is taken from the IS convertible. The rear is taken from the IS Sedan. Put together with a revised naturally-aspirated 5.0-liter V8 from the IS-F and pushing the rear wheels, the RC F is a formidable sports car. With an immense powerband peaking at a 7,300 RPM redline, the noises it makes can be subtle until asked to produce juice; then listen for a raspy rumble that says things are about to go quick. While the RC F provides all the creature comforts one would expect, this coupe is a performer that is ready to tear up the tarmac. Jaguar’s bespoke supercar looked like nothing else on the road — incorporating Jaguar’s trademark litheness over a layout quite unlike anything produced before, except, perhaps, the one-off Jaguar XJ13, which served as one of the main inspirations for the XJ220. Unlike its predecessor, the XJ220 was designed from the get-go to be the fastest road car in the world. This it gloriously achieved, reaching 217 mph and echoing Jaguar’s top speed record-setting triumphs in the 1950s. The XJ220 bi-turbo V6’s 542 horsepower gives blistering acceleration, and the aerodynamically impressive body provides both low drag and reduced lift at the high speeds the XJ220 is capable of. This helped a later racing version, the XJ220C to an impressive showing at the 1993 Le Mans. In short, the XJ220 is a staggeringly impressive cat that has few peers. 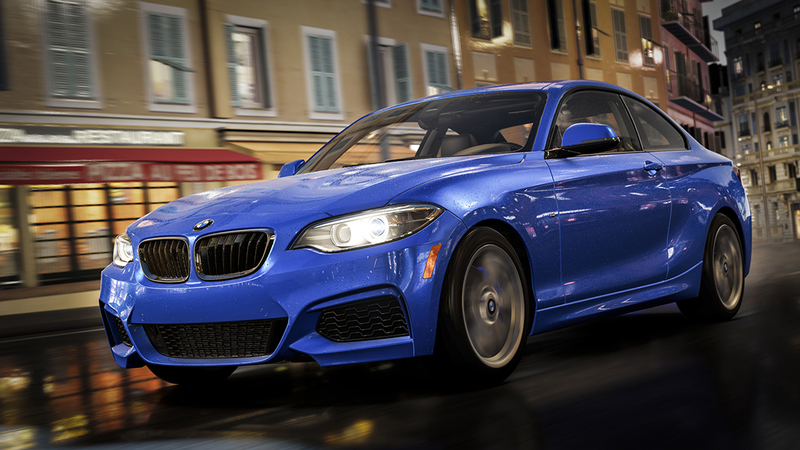 The newest entry to BMW’s M line is the M235i. Here you have an entry-level BMW that delivers performance that is near equal to that of the more upscale M3 or M4. It’s a smaller package on the outside with all the gusto of the bigger models on the inside. The driving experience is everything an enthusiast desires; well over 300 horses are raring to push you on your way, and a stiff yet still comfortable ride awaits. It may sound relatively tame, hence the enhanced “vroom-vrooms” piped into the cabin via the car stereo, but the forced induction inline six does just what you want it to when it’s time to go: it goes. Dubbed the “Rambo Lambo”, the Lamborghini Military model 002 certainly looks the part. Sylvester Stallone even owned one of the 300 or so muscular models that were produced over seven years. So did Mike Tyson, Tina Turner, and a slew of Middle Eastern figures that have since been deposed. If its looks don’t give it away, this is a high-performance off-road vehicle. It has a tube steel frame, massive ground clearance, heavy-duty suspension, and tires so big they were specially designed by Pirelli. Under the massive hood is what you might expect, although it is an odd place to find the V12 from the Countach Quattrovalvole. Compression is slightly lower to accommodate the lesser fuels that might be put into its massive 76-gallon tank. The LM002 is a vehicle that was way ahead of its time. With a near eight second 0-60 time and top speeds on and off road of nearly 120 mph, you can tear up any surface in the lap of luxury. 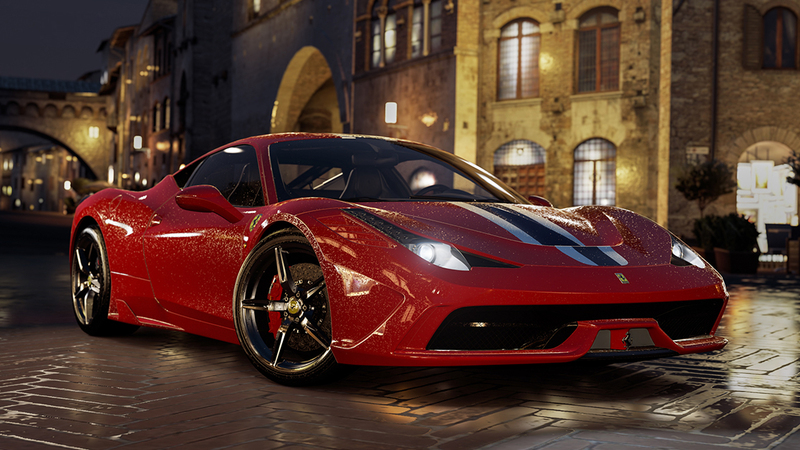 The 458 Speciale is the car that will stop your heart and then kickstart it again, all in a span of a sprint to the next red light. It will sing you to sleep every night with its rapturous exhaust note, it will embrace you firmly in its carbon fiber seats and never let you go. The Speciale is special in every sense of the word; it tops the Italia by reducing weight, increasing output, enhancing handling, and providing an epic driving experience. At a glance you will recognize the telltale striping of its predecessors the 360 Challenge Stradale and 430 Scuderia. Up close you will note subtle body flourishes that aid aerodynamics. Yes, the Speciale is stripped down, but what remains is a tantalizing package that represents the one of the purest driver-focused cars ever built. This month’s free car is full of character, charisma and racing history. 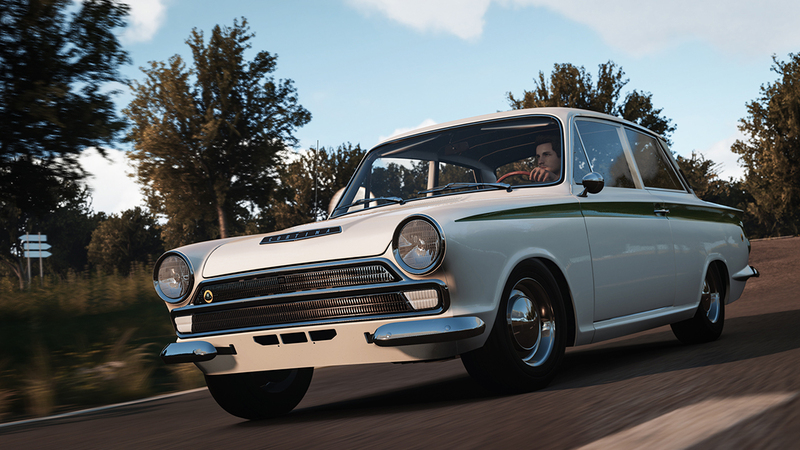 You may remember the lovely 1966 Ford Lotus Cortina from previous Forza games as it has earned a place in many a Forza fan’s heart. What will you do with your Cortina? One of the first “race on Sunday, commute on Monday” factory cars, the Lotus Cortina built its reputation on the track and in people’s daily lives. Henry Ford II assigned Lotus’ Colin Chapman the task of building a Ford that was performance inspired and could give Ford some racing credibility. The Cortina did so in triplicate, winning rally and touring car championships right and left and being driven by the likes of Jim Clark. The Cortina provides a peppy 0-60 time of just under 10 seconds and adroit cornering, partially in part to its dainty 2,060 pounds of weight. Without doubt, credit needs to also be given to its 115 horsepower, which are generated by a twin-cam 1.6-liter four-cylinder with thirsty and throaty sounding dual-Weber carbs. While this car can carry four people in relative comfort, it is most happy when being revved high and thrown into a corner with full gusto. The Top Gear car pack for Forza Horizon 2 for Xbox One is now available for $5 U.S. on the Xbox Marketplace or through the Forza Hub app for Xbox One. The Top Gear Car Pack is included free for Forza Horizon 2 Car Pass owners. Don’t miss the new season of Top Gear U.K. airing now on Xbox Video and television. Check your local listings for the next episode.